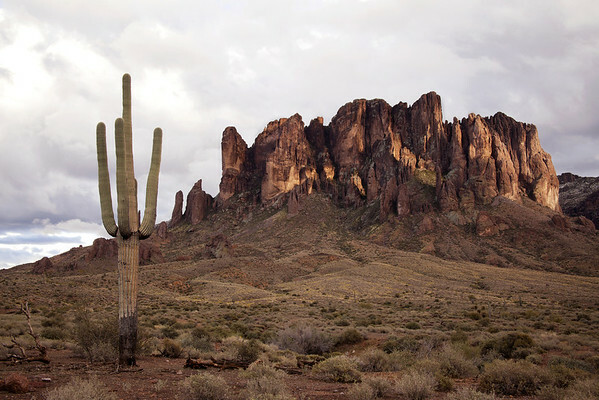 The Superstition Mountains (their name inspired by Pima Indian legends) have been a source of mystery and legend since early times. The area is dotted with ancient cliff dwellings and caves, many showing signs of former habitation. It is not certain who these people were; some believe they were Salado or Hohokam Indians who populated this part of Arizona several centuries ago. Later, Pimas and "Apaches" (some of whom may have been Yavapais) occupied parts of the region. However, the name "Apache" came to be closely associated with the Superstitions, and the mountains became an Apache stronghold in the 1800s. During the 1840s the Peralta family of northern Mexico supposedly developed rich gold mine(s) in the Superstitions. Their last expedition to carry gold back to Mexico occurred in 1848. According to legend, the large party was ambushed by Apaches, and all were killed except for one or two Peralta family members who escaped into Mexico. This area is known today as the Massacre Grounds. A number of other people were supposed to have known the mine's location or even to have worked it. Numerous maps have surfaced over the years, only to become lost or misplaced when interested parties pressed for facts. Men who claimed to have found the Peralta mine were unable to return to it or some disaster occurred before they could file a claim, all adding to the lore of a "lost mine." In the 1870s Jacob Waltz, "the Dutchman" (actually a native of Germany) was said to have located the mine through the aid of a Peralta descendant. Waltz and his partner, Jacob Weiser worked the mine and allegedly hid one or more caches of gold in the Superstitions. Most stories place the gold in the vicinity of Weaver's Needle, a well known landmark. Weiser was killed by Apaches, or according to some, by Waltz himself. In failing health, Jacob Waltz moved to Phoenix and died some twenty years later in 1891. He supposedly described the mine's location to Julia Thomas, a neighbor who took care of him prior to his death. Neither she nor dozens of other seekers in the years that followed were able to find the "Lost Dutchman's Mine." Subsequent searchers have sometimes met with foul play or even death, contributing to the superstition and legend that surround these mountains. Many versions of the "Lost Dutchman Mine" story exist, and several books and films have been done on the subject.